I have had several conversations with relatively new parents in which the question of how/whether to talk math with babies. I always try to help such parents see math like they see reading. You read with your baby long before she knows what your words mean. An important reason to do so is to immerse the child in language. This is how she will learn language. Reading books increases the variety and quality of language the child is exposed to. It’s the same with math. We can surround our children with number and shape long before they understand what these things mean. It is through this exposure that they learn. For parents of children of all ages, this principle applies. Don’t worry about whether the child can get right answers; make a conscious effort to notice number and shape in your world together. It is through this exposure that they will learn. To this end, Tabitha and I have been playing with the scales at the grocery store. Not the ones at the checkout; the ones in the produce department. The other day we found a rather large onion. Here she is holding the onion safely back at home. Me: What do you think this weighs? Tabitha (8 years old): Four pounds. Me: Hmmm…I say a pound and a half. She is easily influenced. We put it on the scale. It’s a pound and a quarter. I celebrate my victory briefly. Then Tabitha notices the bananas are nearby. There are several individual bananas lying loose. She grabs one and begins to put it on the scale. Me: Wait! Not yet! Let’s guess what it weighs. T: With the onion…two pounds. We add it in and see that now it’s very close to one and a half pounds. Pretty soon we are weighing bananas by the bunch and guessing whether an avocado is heavier than a banana. We are surrounding ourselves with numbers and having a grand old time. Immersing your child in numbers is low stakes and opportunities are everywhere. We grocery shop every week, but have only recently started playing with the scales. As a general principle, anytime you encounter a number in the company of your children, you can talk about it. When the children are infants, they won’t participate. That’s OK. They’ll learn that numbers are things to talk about. When the children are older, they’ll make wildly inaccurate guesses. That’s OK. They’re getting practice talking about numbers. When the children are even older, they’ll start to turn their wildly inaccurate guesses into serious learning. Along the way, they’ll initiate the conversations themselves because you will have taught them that numbers are things people talk about. There was a while when Tabitha (five and six years old at the time) would try to get away without wearing underpants when she dressed herself. Those days are pretty much over, but I still like to make sure she has done the complete job, so I ask her from time to time. Tabitha (7 years old): I’m dressed! Me: Are you wearing underpants? Don’t worry. The child is not wearing these in the picture. Me: Nice. 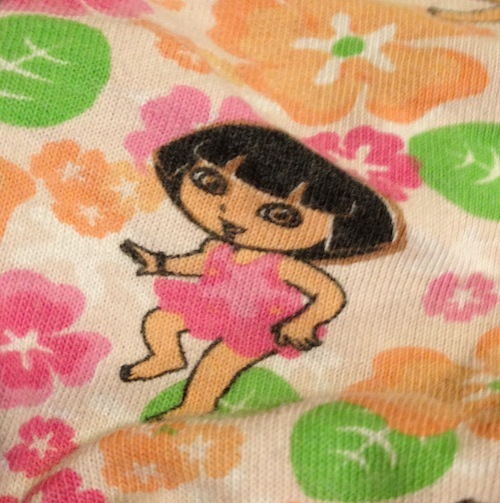 How do you feel about your Dora the Explorer underpants? T: I don’t really like Dora that much, but I have a thousand of them. T: I counted them once. T: No. I don’t really have a thousand. I don’t even know how to count to a thousand. Just to ten hundred. I pause for a moment. Does she mean one-hundred-ten? Can’t be. She must know that one-hundred-eleven comes next. Me: Ten hundred. You mean like after nine hundred is ten hundred? T: Yeah. That’s as high as I know how to count. I don’t even know how many a thousand is. Me: A thousand is ten hundred. A few minutes later, I get an idea. I wonder how she would write ten hundred. She needs to get out the door for school so I make it quick. I ask her to read some numbers out loud as I write them. For that last one, she says one thousand. I ask how she would write ten hundred. Me: Because I just told you that. Right. How would you have written ten hundred before I told you it was the same as one thousand? She shrugs her shoulders. Drat. Moment lost. We talk about hundreds for a moment. One hundred, two hundred, etc. up to ten hundred. Then I have one more. Me: OK. Last one, then off to school. How would you read this one? She looks for a moment. And thinks. I zip up her sweatshirt and send her out the door to catch her bus. A recent research article argued that children learn a lot about place value through everyday conversation, and that kindergarteners know a lot more about the structure of the number system than parents and kindergarten teachers (on average) think they do. Here you can see that knowledge in action. Tabitha knows that 1000 is a big and important number. She knows the pattern that allows you to keep counting by hundreds. She has not put these two pieces together. A short conversation helped her put those two pieces together, and then to extend the pattern. This didn’t start out as a math talk. It began as a clothing inspection. But the opportunity presented itself. Listen for those times your children use numbers, and ask follow up questions about them. You won’t get this much learning out of every such conversation, but if even 10% of those opportunities turn into a little bit of learning, the interest compounds.